UFO SIGHTINGS DAILY: UFO Researcher Finds Ancient Ship In Alaska, July 2, 2015, UFO Sighting News. 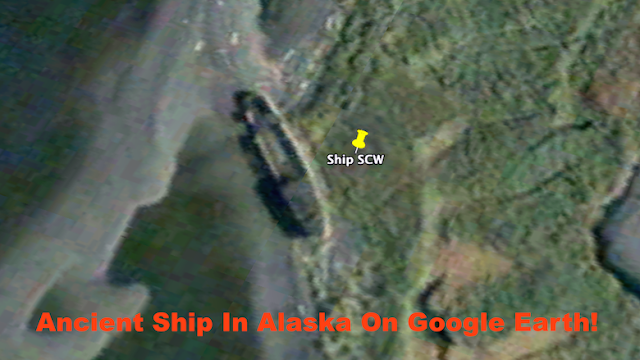 UFO Researcher Finds Ancient Ship In Alaska, July 2, 2015, UFO Sighting News. I wanted to test my skills on Google Earth at finding ancient ships. Many people have tried to tell me that what I report on mars is not real, its just in my head. The term is called "pareidolia." I have a masters degree in counseling education. I know all about that and much more and what those morons are doing is embedding...that means they learn one technique word and they apply it to everything they see. Its a sign of an amateur...which clearly they are. This is a ship and it took me about 5-7 minutes to find. I also found about 6 others near by that may be ships, but may not be. I only wanted to report the sure thing, to erase all doubt about my skills. I found a 41 meter ship, what you do with this knowledge is up to you. Trust me when I report Mars structures. I have a good head on my shoulders.